Houston we have a problem!!!!! Ok as title states I have an issue. 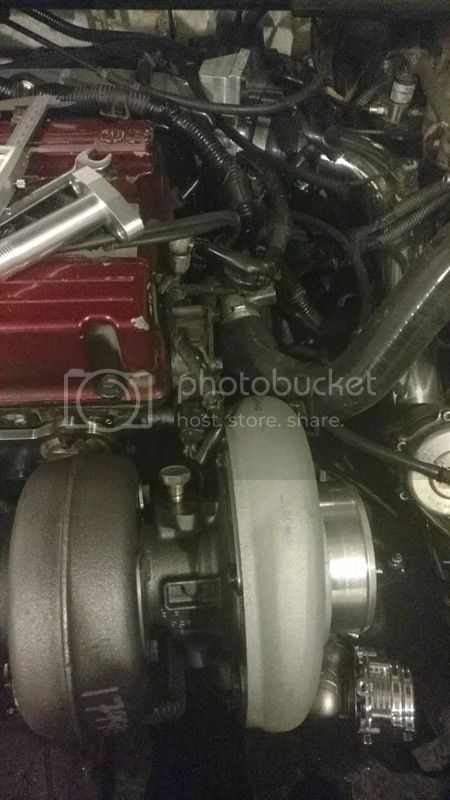 As you can see in the pic, upper rad pipe does not want to fit with the new turbo. I have been searching around and cannot find anything or any way to fix this problem. What do you guys think. There is less then a inch between the housing and the bend in the rad hose. Option one would be to cut the hose a little to make the 90* bend and see if that will work, but then I will be sort on the other side. Other option would be to see if I could swap the thermostat fitting 90* and see if I can get or make a custom hose. What do you guys think? 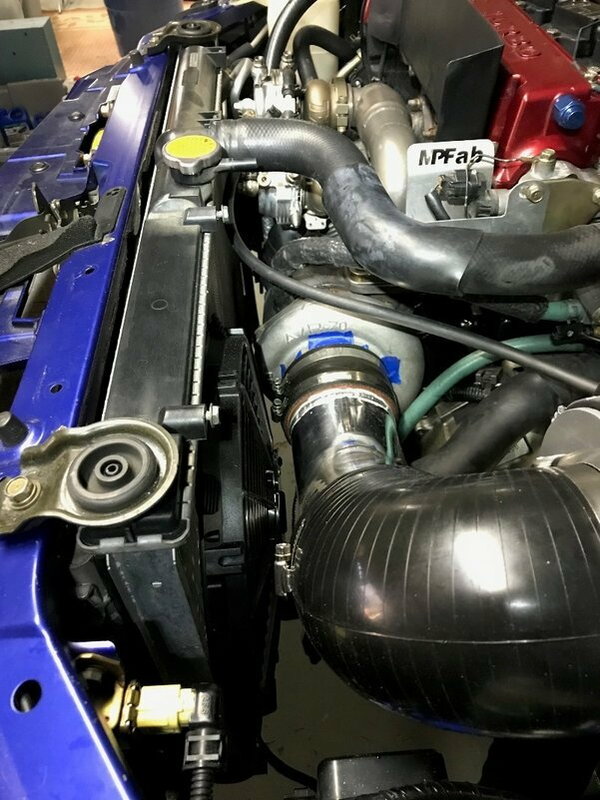 A little info on the setup is JM fabs top mount manifold, Divided t4 hotside that sites on an upgraded Borg Warner s371. 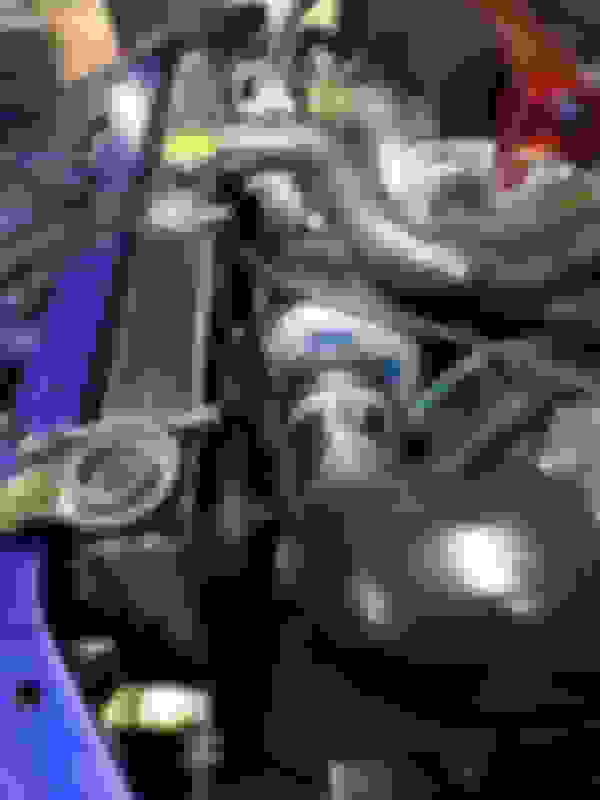 I have another issue but its not as big but one of the wastegates also would hit where the rad would sit. I have to get a half size rad for this being as you see everything is now in the way. How about getting one of those flexible radiator hoses ? Something similar to the below link . 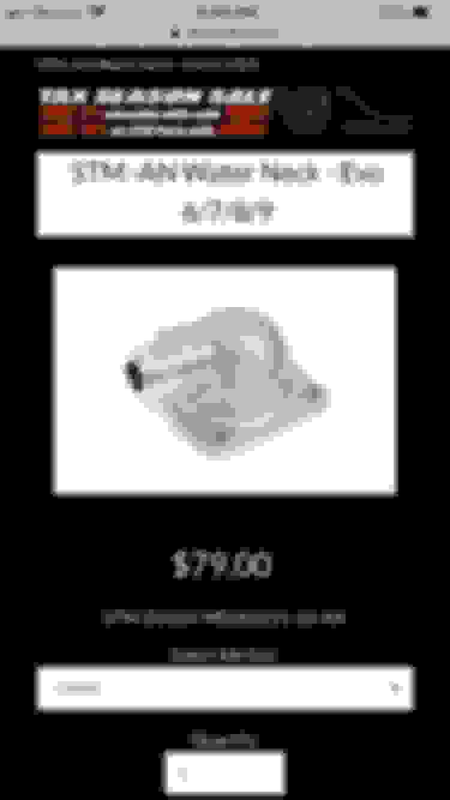 Please note, I dont recall the exact diameter of the evo radiator hose, the below link is just for reference of the flexible hose style I’m referring to . 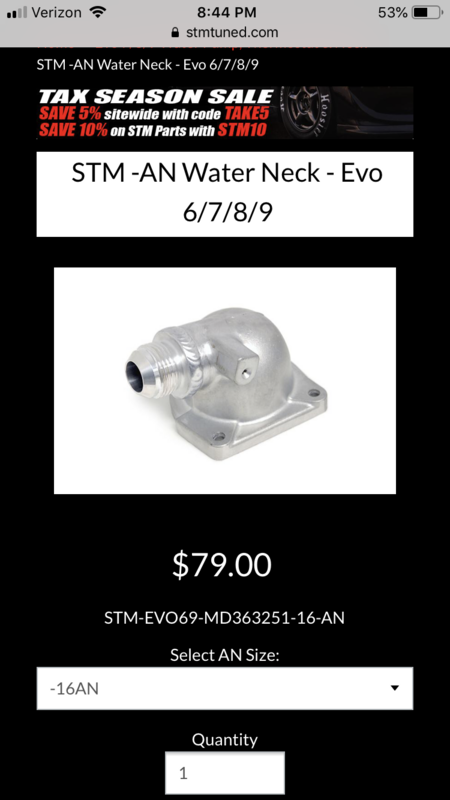 Reach out to STM and see if they can put the an fitting on the side facing the battery. Then run -16 hose to your new rad which will also need a -16 fitting. Thanks for the reply guys. The flexable rad hose I didn't even think about and that maybe a good idea. I will have to talk to summit about it and see what they think. wht95scort, I was looking into that and idk if they will do the 90 style. I don't know if a 90 -16 fitting would hit the turbo or not either but I have though about this idea. I will have to look and see how much room I actually have that way I can tell whoever I talk to the clearance I need and see what we can do. Again thanks for the replys I will keep you posted on what I find. You cant fit a slim rad in there like the one CSF offers? 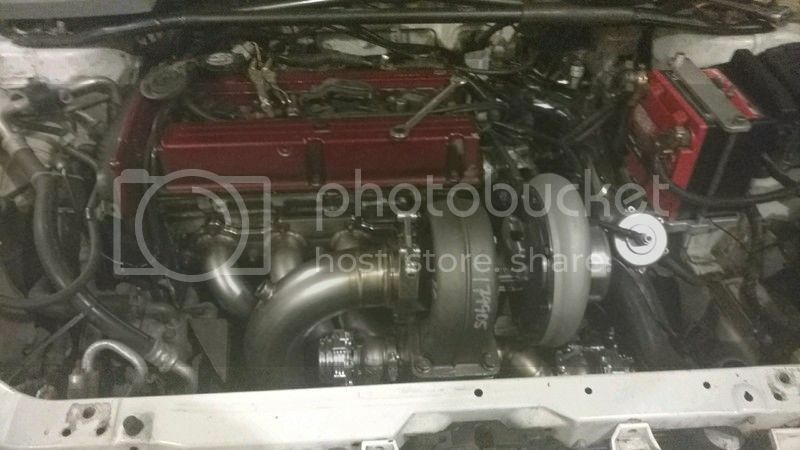 JMF says that manifold will work with a full rad as long as the turbo clears, so the gate shouldn't be an issue. 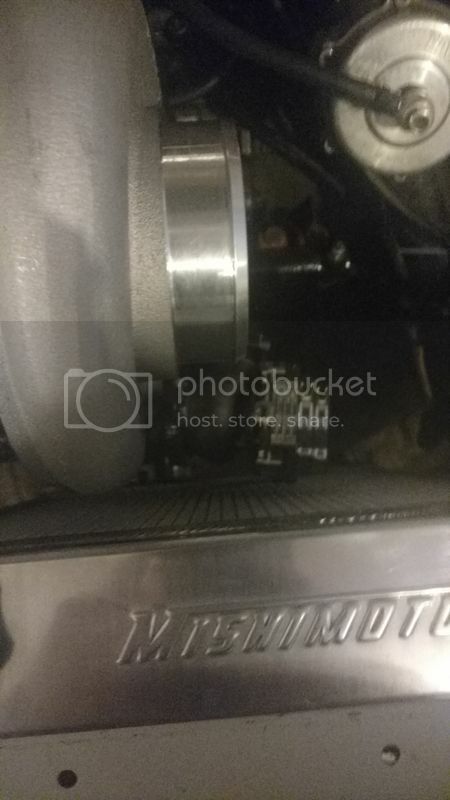 The turbine housing is right about the same location as the radiator inlet in stock configuration. When I ran my custom top mount I went with the Mirage radiator, which is slightly thinner and moves the inlet towards the driver's side. I have this whole setup just sitting in a box if you're interested. 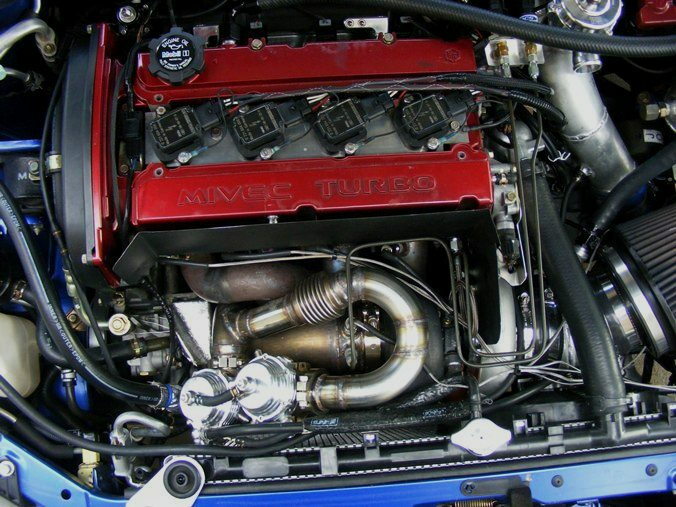 Agree the wastegate should clear the radiator so post a picture if you can to show the clearance issue. 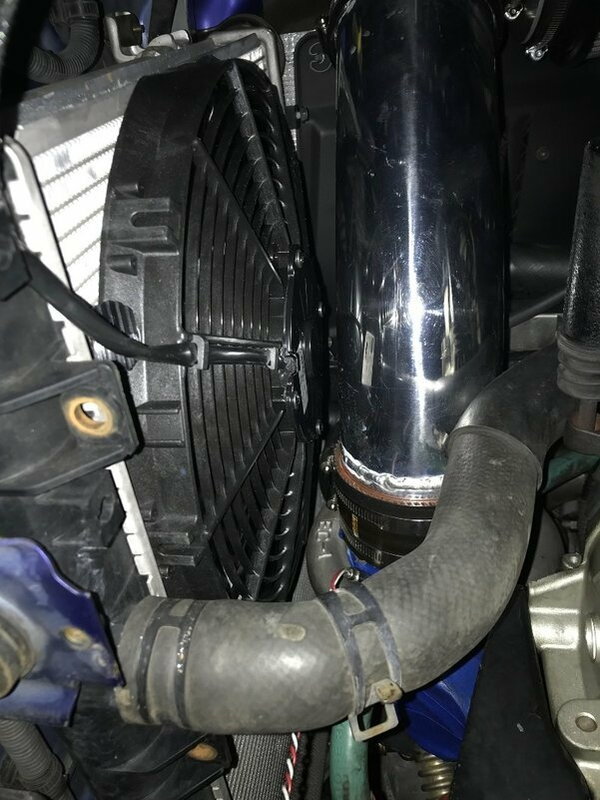 In looking at my pic below you would likely need to make a custom aluminum tube for the upper radiator hose to snake around the compressor inlet. I know what the website says but the turbo is pretty big. If it were a garrett or a pte turbo I am sure it would be ok. As said in the post above it litterly sits about a inch and a half from the water neck on the t stat housing. I actually thought about doing a 90* elbow with a STM welded bung on the t stat housing that should give me enough room, then weld a bung on the rad. I can move my fan over a tad to make it work being i am using a 12" fan. I will know when parts get here. Thats a nice setup man. I wish I had the cash I would think about picking it up. I think with braided line I should be ok. I have it planned out looking at it again. The rad I have is thicker then stock one. This is why it wont work with my setup. It is all aluminum worked really well but its 3 inches thick. Why I went half rad being every top mount fit with it lol. I am keeping my ac, and all that goes into that, that is why I think it sits so far over. When my rad comes in I will take a pic to see where everything lines up and will update this thread for you guys. Again thank you for the help. OK update, I have my radiator in and I have another issue. Now what? no room for a fan. This manifold is suppose to be able to keep ac and stock rad. I didnt have a stock rad mine was thicker. Bought half rad and no room as you see above for a fan. Keeping ac any suggestions? I have some thoughts. One would be cut the weld where the wastegate meets the mani and re weld it at a different angle. Idk if JM fabs would like that if i ever have to have warrenty work done. Second thing would be to remove my horn and ac canister and see if i can sneak a fan behind both of those. What do you guys think? Install a slim rad like I suggested. The mishimoto rad is thick. Have you tried contacting JMFab at all? No I haven't contacted JM fabs yet. I am currently as i am doing this typing an email to them as we speak. Time is not on my side with this being work is killing me 12 hr days and no time to relax let alone work on the car. I have a slim fan that is made my Maradyne but its a tad bit thicker being its 2" thick. As you can see in the pic there is maybe less then a 1/4 inch. I guess we will see what JM fabs says. I'm not talking about a fan right now. I'm talking about the radiator. A. That mishimoto is super thick, you will have more room with an actual slim rad from CSF. B. Mishimoto is absolute garbage anyways. Yeah I clicked on the link and saw those rads, uber nice. I have some ideas on what I can do and they aren't pretty. I am thinking like you said about getting a different rad, and I have to look at all options but thats kinda what I'm leaning towards. If I can take the bumper cover off and see if I can move some stuff around I'll go that route. Idk I have to look at it again and see what will be the easiest and cheapest solution at this point. Thanks for the link to the rads, I will have to see if I can sell some stuff maybe to recoup some cash and maybe pick one up. Thanks for the time and help its much appreciated. You live in Michigan so the thinner mirage radiator would be fine for that climate. What is the spacing between the compressor inlet and the radiator? Looks to be at least 1.5". Post a shot panned out so we can see the entire space and put dimensions on the picture. I run the SPAL 30100467 12" Low-Profile fan (909 cfm) on mine.